Biomass Energy with Carbon Capture and Storage (BECCS) offers a comprehensive review of the characteristics of BECCS technologies in relation to its various applications. 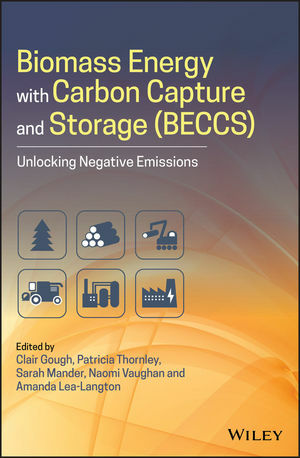 The authors — a team of expert professionals — bring together in one volume the technical, scientific, social, economic and governance issues relating to the potential deployment of BECCS as a key approach to climate change mitigation. Clair Gough is a Research Fellow at the Tyndall Centre for Climate Change Research in the School of Mechanical, Aerospace and Civil Engineering at the University of Manchester. Patricia Thornley is a Professor of sustainable energy systems in the School of Mechanical, Aerospace and Civil Engineering at the University of Manchester and director of the UK's Supergen Bioenergy Hub. Sarah Mander is a Senior Research Fellow in the School of Mechanical, Aerospace and Civil Engineering at the Tyndall Centre for Climate Change Research at the University of Manchester. Naomi Vaughan is a lecturer in climate change at the Tyndall Centre for Climate Change Research at the School of Environmental Sciences at the University of East Anglia. Amanda Lea-Langton is a Lecturer in bioenergy engineering in the School of Mechanical, Aerospace and Civil Engineering, University of Manchester.